Shipping is a global service industry that, by general recognition, provides the lifeline of international trade. Suffice it to say that, due to the morphology of our planet, 90% of international trade takes place by sea. Technological developments in ship design and construction, and the ensuing economies of scale of larger ships, have in their turn promoted trade-particularly that of developing countries – by making the transportation of goods over long distances affordable. This has expanded markets for raw materials and final products, it has reduced unit costs, and has facilitated the industrialization of many countries around the world. Often, international ocean transportation and Information and Communication Technologies (ICT) are referred to as the two basic pillars of globalization (Stiglitz, 2006). 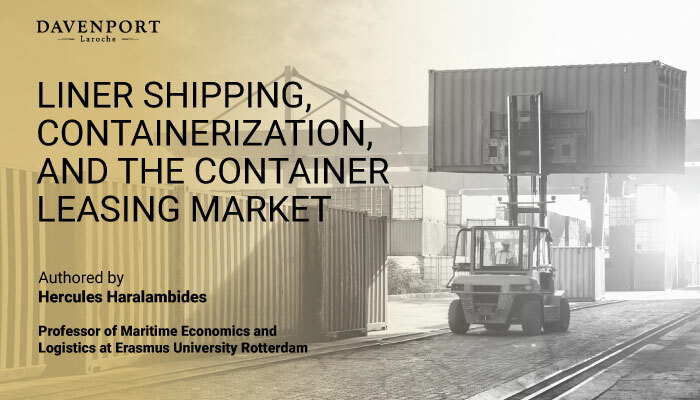 Download the report authored by Hercules Haralambides, Professor of Maritime Economics and Logistics at Erasmus University Rotterdam to find more about liner shipping, containerization, and the container leasing market.